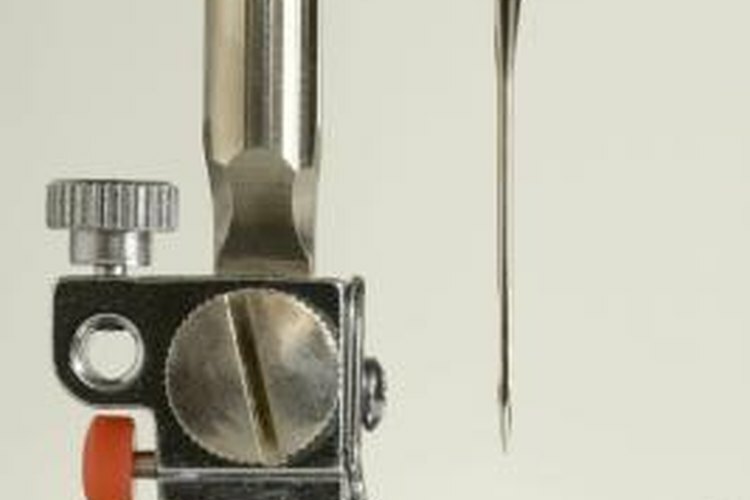 A sharp sewing machine needle will make the work go faster. A cozy fleece neck gaiter helps seal the gap between your collar and a warm hat -- just the thing to wear on a walk in the cool weather, or during cold winter excursions. Convenient, useful neck gaiters are really just a simple tube with only two straight seams. Sewing your own neck gaiter makes a great first project with a sewing machine, although you can also sew one by hand fairly quickly. Cut a 23-inch-by-19-inch piece of stretchy, non-cotton fleece for an adult-size neck gaiter, or a 21-inch-by-17-inch piece for a child's neck gaiter. Orient your cut so the fabric is stretchiest when you pull on the short edges. Lay the fabric right side up; fold the top of the rectangle down to the bottom. Pin and sew with a medium zigzag stitch, leaving a 1/2-inch seam allowance. Fold the resulting fabric tube in half, matching the raw edges on the short end of the rectangle. Pin and sew the raw edges, again using a medium zigzag stitch and 1/2-inch seam allowance. Leave a 3- or 4-inch gap, large enough to insert your hand into the folded tube -- really now more of a doughnut -- that you've sewn. Use your scissors or a rotary cutter to trim all seam allowances to 1/4 inch. Turn the tube inside-out through the opening you left. Stitch the opening closed. Either whip-stitch by hand, or fold the edges under and stitch them in place with your sewing machine. Give your gaiter a more finished look by top-stitching 1/4 inch on both sides of the seam you just closed, using a straight stitch. Use the same stitch to top-stitch both the top and bottom edges, again using a 1/4-inch seam allowance.